The present day plate boundaries of North and South America can be interpreted by the distribution of earthquakes across the region. The North American plate extends from the mid-ocean ridge of the Atlantic to the west coast of the American continent and into eastern Siberia (Bally 1989). The South American plate extends from the mid-ocean ridge of the Atlantic to the west coast of the South American continent (Benjamin 1991). Although intraplate earthquakes are common in the Americas, the strike-slip and thrust faulting along the western margin of both continents produces the most hazardous earthquakes of the region (Bally 1989). Distribution of earthquakes of magnitude > 6 from 1900-2013. GeoMapApp 3.3.8. The North American plate consists of a single craton, the Laurentia craton, with smaller terrains sutured to it (Bally 1989). Slightly deformed sedimentary layers overlaying the continent indicate that the craton itself is relatively stable (Bally 1989). 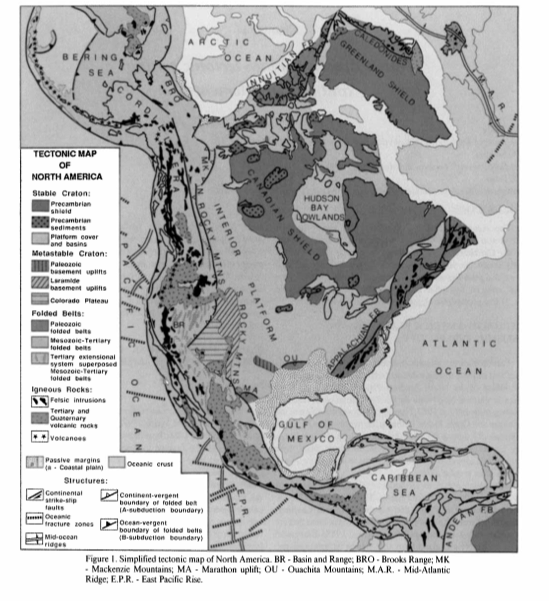 Major structures within the North American continent consist of the Appalachains, which marks the collision of the continent with northern Africa and Europe during the Paleozoic (Bally 1989). During the Oligocene period, the Pacific (Faralon) plate began subducting beneath the western margin of the North American plate (Bally 1989). This resulted in a compressional regime, producing mobile belts along the entire western coast of the continent, such as the Rocky Mountains in the southern United States, to the Brooks Range in Alaska (Bally 1989). The Yellowstone hotspot, a remarkable feature of the North American plate, is found within a continental volcanic caldera in Wyoming (Kenneth 2009). The origins of the hotspot are ambiguous, yet leading theories can be found here. Presently, major changes in the relative motion of the North American and the Pacific plates has resulted in a change of the stress regime of the North American plate (Bally 1989). The compressional regime has been replaced by an extensional regime (Bally 1989). Surface expression of the extensional stresses included the Basin and Range province and the extensional tectonics along California (Bally 1989). The South American plate consist of multiple cratons. The continent can be divided into two major components, the Amazonian craton in the north and the Brasiliano domain in the south (Benjamin 1991). The Amazonian craton is formed of crust from multiple ages, Archean to mid-Proterozoic and was stabilized about 1.0Ga ago (Benjamin 1991). In comparison, the brasiliano domain is an amalgamation of the Sao Francisco, Sao Luiz and Rio de la Plata cratons, as well as other smaller microplates and terrains (Benjamin 1991). The coast of the South American continent exhibits margin orogenies, which formed by thrust mechanisms during plate collisions (Benjamin 1991). One note worthy example is the formation of the Andes Orogeny along the western coast of the south American plate. The Andes are a result of compressional regimes induced by subduction of the Nazca and Pacific oceanic plates beneath the south American plate (Onno 2006). Intraplate orogenies within the Brasiliano domain exist as well, which display a number of different possible formation mechanism (Benjamin 1991). Bally, Albert W., C.R. Scotese, and M.I. Ross. The Geology of North America - An Overview. 1st. A. 1989. 1-15. Print. Benjamin Bley de Brito Neves, Umberto G. Cordani 1991. 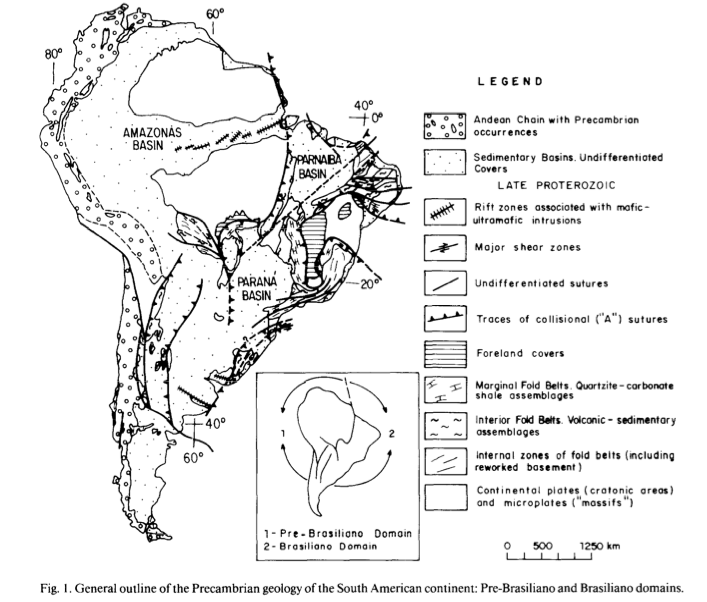 Tectonic evolution of South America during the Late Proterozoic. Precambrian Research, v. 53 ( 1991 ) p. 23-40. Onno Oncken, Guillermo Chong, Gerhard Franz, Hans-Jürgen Götze, Victor A. Ramos, Manfred R. Strecker, Peter Wigger, 2006. The Andes, active Subduction Orogeny. Frontiers in Earth Sciences.